1. Make a book about why you love your spouse and why you are thankful for him/her. 2. Surprise your spouse with a special getaway together. 3. If possible, go on a date with your spouse to a restaurant that you enjoyed when you first met. After you order your meal, take some time to write down favorite memories from the past year. 4. If you live far across the miles from your Valentine, send a care package filled with things that are red. 5. Make a meal with symbols of love. Examples: Write I love you with string beans, make a tart in the shape of a heart. 6. On individual note cards, write why you love your spouse. Insert these cards in a small photo album. 7. Write a poem for your spouse and frame it. 8. 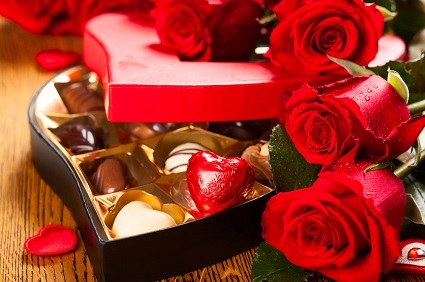 Surprise your spouse by taking a vacation from work and enjoy Valentine’s Day at home. 9. Give your spouse a dozen roses. On each stem, attach a note for a future date. 10. Fill a large box with helium balloons and special gifts for Valentine’s Day.